A palette of color awaits you as you wind along the entrance to Holland's treasured island. Tour up into DeZwaan, the only authentic Dutch windmill operating in the United States, grinding locally-grown wheat into flour, which you can purchase in the gift shop. DeZwaan sports a new deck and a restored grinding system. Take a guided tour of the mill with authentically-costumed guides; you might even meet the Dutch-certified miller and see the milling process in action. From the fourth-floor deck, you can survey 36 acres of manicured gardens, dikes, and canals. 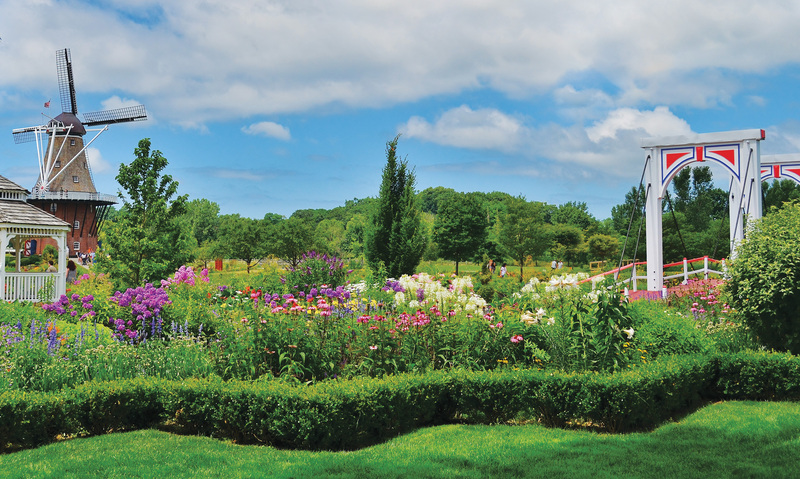 Throughout Windmill Island Gardens, you'll also find more costumed guides, an Amsterdam street organ, a hand-painted Dutch carousel, children's playground, picnic areas, all the flags of the Netherlands, horses in the back pasture, a replica of a Dutch Inn, gift shops, and much more. In the spring, see more than 100,000 tulips in bloom throughout the Gardens, including a mass planting of more than 60,000 blooms. Windmill Island Gardens is a popular venue for weddings and other special events. Windmill Island Gardens now has a Sky Cam! Get a live look at the windmill, canal and bridge, and the surrounding area. Interested in more Dutch Experiences?